In this article, we will show you, How to Format Power BI Multi-Row Card with example. 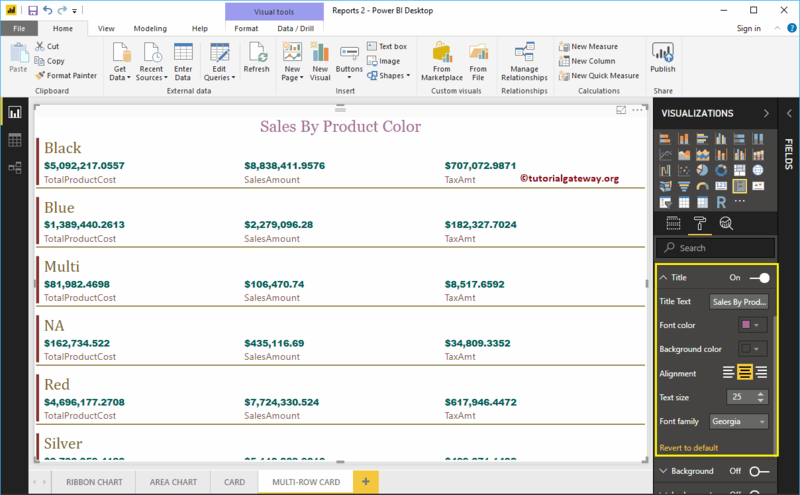 This includes Data Labels, Category label Colors, enabling the Chart Title, formatting Cards, background colors etc. 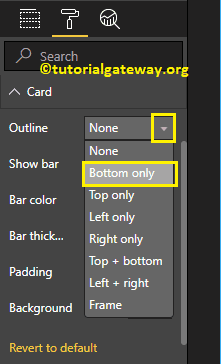 To demonstrate these formatting options, we are going to use the Multi-Row Card that we created earlier. Please refer Multi-Row Card in Power BI article to understand the steps involved in creating a Multi-Row Card in Power BI. 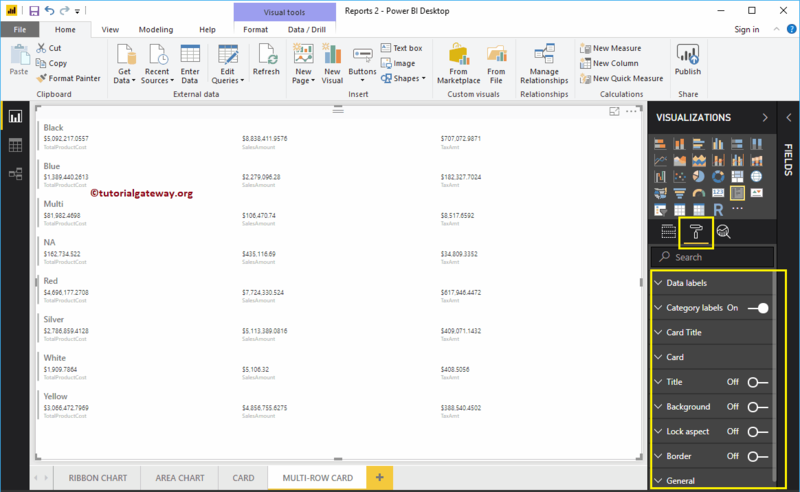 Please click on the Format button to see the list of formatting options that are available for this Multi-Row Card. Data Labels display the Metric Values (Sales Amount, or Order Quantity, or Total Product Cost). As you can see from the below screenshot, we changed the Data Label Color to Green, Text Size to 14, and Font Family to Arial Black. Category Labels means Column Name of the Metric Values that we used in the Multi-Row Card. 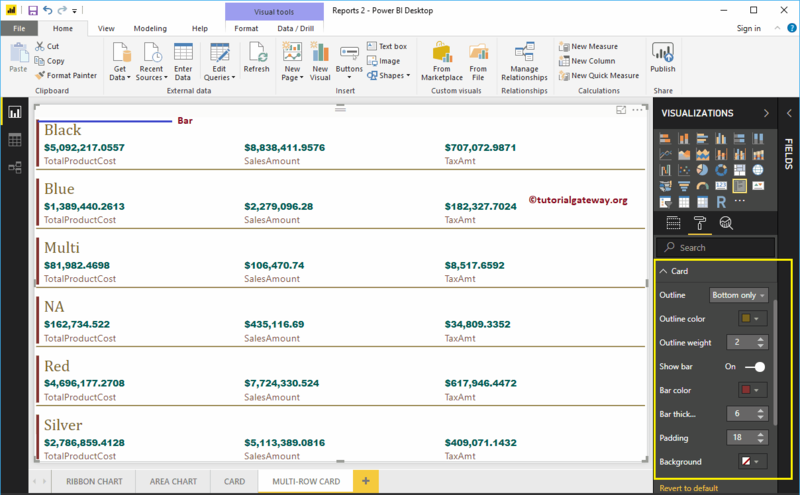 From the below screenshot you can see, we changed the Category Labels Color to Brown, and Text Size to 15. Card Title means the Multi-Row Card Group Names. From the below screenshot you can see, we change the Color to Gold, Font Family to Cambria, and Text Size to 25. 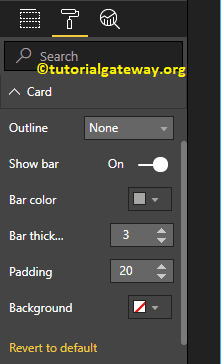 Use this section to change the individual Card appearance. Following are the list of options that are available in this section. Outline property is used to enable Line around individual card. As you can see from the below screenshot, we enabled the Outline to Bottom Only. By toggling the Title option from Off to On you can enable the title of a Multi-Row Card. 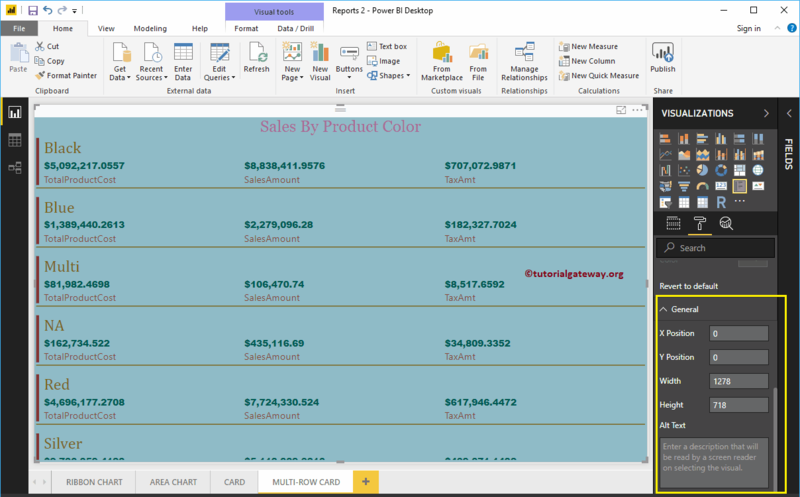 From the below screenshot you can see, we change the Title Text to Sales By Product Color, Font Color to Pink, Title Alignment to center, Font Family to Georgia, and Text Size to 25. You can add Background color to a Multi-Row Card by toggling Background option to On. For the demonstration purpose, we added some random color with 30% transparency. Similarly, you can add the Borders to a Multi-Row Card by toggling Border option from Off to On.